We unfortunately have to tell you that the reading is being cancelled. We will eventually announce a new date for the reading. As a part of our ongoing exhibition “Behind the Same Façades” the artists Kajsa Dahlberg and Gritt-Uldall-Jessen invite you to take part in a collective reading of a reworked edition of the manuscript “In Godot’s Waiting Room”, taking place at The Trampoline House in Copenhagen. The artists have reworked the manuscript together with a group of people from The Trampoline House. The reworked manuscript depart from experiences of waiting related to the process of seeking asylumn. Often the temporary state of seeking asylumn becomes a cronic state of waiting. The collective reading of the manuscript is a part of the 6th year celebration of The Trampoline House, taking place on the 2nd of june, 2017. 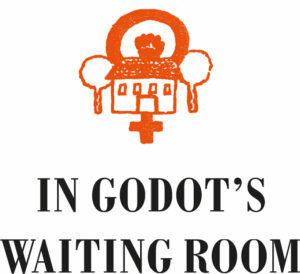 The work combines two stories that both relate to Samuel Beckett’s famous play “Waiting for Godot”. The first story is a play that combines text taken from Beckett’s original manuscript with texts from a diary written by women starting a squat in Umeå in 1983. On display at Skånes konstförening is a poster originally used during the squat and video of a reading of Dahlberg and Gritt Uldall-Jessen’s text in Umeå 2011 – when Charlotte Nordenfors, Gunilla Nordenfors, Kerstin Norlander (who all participated in the occupation in 1983) plus the artists themselves and artist Malin Arnell presented the text at Norrlandsoperan (The Umeå Opera House).